Week 29 of our weekly round-ups of “blasphemy” news and views. What makes the letter so groundbreaking is the list of supporters. The signatories include many individual Bangladeshi atheist bloggers under threat, as well as artists, writers and academics, but also a roll-call of international atheist, humanist, and secularist bloggers (especially from the flourishing American online scene, such as PZ Myers, Hemant Mehta, Richard Carrier, Ophelia Benson). 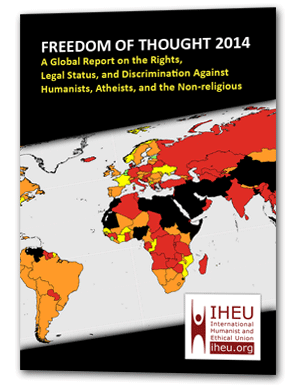 They’re joined by major freedom of expression campaign organisations (including Reporters Without Borders, Index on Censorship), as well as liberal religious groups (such as Muslims for Progressive Values, and Christian Solidarity Worldwide), Ex-Muslim “apostate” groups, and the leaders of numerous national Humanist associations under the umbrella of the International Humanist and Ethical Union (IHEU). Read the letter itself in English and in Bangla. The action was covered in Bangladesh’s Daily Star (“Open letter urges arrest of ‘blogger-killers’“) and BDNews24.com (“Global free speech campaigners protest against blogger killings in Bangladesh“, and in Bangla: “বাংলাদেশে ব্লগার হত্যাকাণ্ডের প্রতিবাদ জানিয়ে মুক্তমনাদের রক্ষায় কার্যকর উদ্যোগ নিতে সরকারের প্রতি আহ্বান জানিয়েছেন দেশি-বিদেশি মানবাধিকারকর্মীরা।“) and some international signatories blogged about their participation, including “Friendly Atheist” Hemant Mehta (“Atheist Activists from Around the World Call on Bangladeshi Officials to Take Action After Blogger Murders”), Ian Bushfield, Executive Director of the British Columbia Humanist Association (“British Columbians Joins Bloggers, Free Speech Campaigners, Humanist Associations, Religious and Ex-Muslim Groups to Protest Bangladeshi Blogger Murders”), Veronica Abbass at Canadian Atheist (“Joint Open Letter to Bangladeshi PM and President”) and philosopher Russell Blackford (“IHEU open letter to Prime Minister and President of Bangladesh“). And indeed the Bangladesh Daily Star today contains credible sources (Touhidur Rahman’s own sister, corroborated by the National Human Rights Commission) that Touhidur was actually arrested back in May. So were they sitting on evidence since then? The question has given rise to further suspicions in Bangladesh that — whatever evidence there may or may not linking Touhidur and the co-arrested to the murders — the announcement and media parading of the suspects this week might be timed to stave off criticism following the recent fourth blogger murder this year. Police in Pakistan arrested three Christian men under terrorism legislation for putting up a poster, officials said this week. The supposedly terroristic poster attributed being a “Prophet” to someone who wasn’t Muhammad. “We have arrested three men, including the son of the priest, because they used the word prophet for the late Fazal Masih,” local police station chief Shahid Tanveer told AFP. The Christians organising the event apologised and asked forgiveness, saying they had used the word to celebrate Masih’s services to religion, but the Muslim clerics refused to accept the apology, he added. An SC [Supreme Court] official said the appeals that were granted leave in 2009 were being taken up by the court. “The petitions granted leave now might be taken up in another six years,” he told The Express Tribune. And she’s not the only “blasphemy” convict awaiting an appeal hearing. On August 12, Justice Shaid Bilal Hassan had put off the hearing on her plea until August 20. Waleeha Irfat was jailed on March 3, 2012, after an FIR was registered against her at the Factory Area police station under Section 295-B (blasphemy) of the Pakistan Penal Code. On August 29, 2013, a seven-member medical board headed by the Health Services director general had said, “She has been found to be suffering from mood disorder (impulsive personality traits). The board is of the opinion that she needs drug treatment and psychotherapy.” The board had been formed on the court’s directive. We cannot find word yet on the outcome of Waleeha Irfat hearing yesterday, assuming it took place. In previous reports, advocates for the complainant blamed the delays on the jailed woman for changing lawyers, noting that no one would take her case because of “the nature of the accusations”. Orthodox activist Dmitry Enteo is “delusional” according to art centre. Here he is being led away by police. The collection at the Manege art centre in central Moscow is, several pieces the less, after “Orthodox” activists reportedly smashed sculptures by Vadim Sidur, in what they termed a protest against “blasphemous” art. A spokesperson for the Manege centre termed the Christian activists “delusional”. “Several sculptures are completely smashed,” she told AFP, adding that police had come and led away the activists. The works were made of plaster and linoleum. … The head of the nationalist God’s Will group is a prominent conservative activist. He cites Orthodox values while picketing and heckling at arts events and protests, sometimes with a television camera crew in tow. 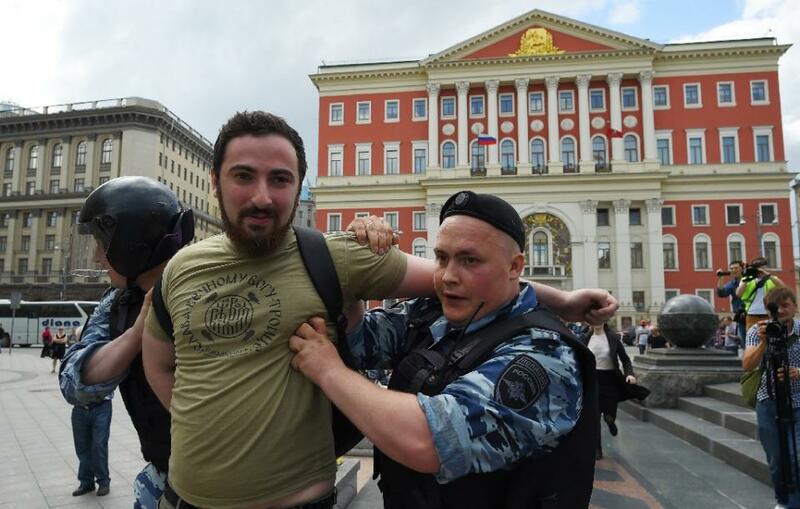 This year he attempted to stop a gay pride rally in Moscow. … In recent years, religious fundamentalist activists have targeted a number of exhibitions in Moscow and forced them to shut down, while organisers have been fined for inciting hatred. Russia’s state-linked news agency, RT, seems to be the only source which claims the events are “disputed” and repeats a rather absurd conspiracy theory by “commenters online”, accusing “the organizers of the exhibition of hiring Enteo to spark a scandal and draw attention to the event, which would otherwise have remained little-known to the general Russian public. A spokesperson for Manezh claimed that the activists smashed several precious statues by Sidur. The sect’s leader, Dmitry Tsronionov, who calls himself Dmitry Enteo, denied vandalizing the exhibits and said he only smashed “a plate from IKEA” on which one of the art objects was displayed. … The group later explained their protest in a statement, saying the art objects displayed at Manezh are “pornographic images of Jesus Christ, dozens of blasphemous items depicting the Crucifixion, libel against Virgin Mary and the saints,” with pornographic apparently referring to Jesus loins exposed. …censoring speech that promotes “fear of the other.” Ominously, the bill would allow the QHRC to pursue websites that in its estimation describe and denounce Islamism. The Act’s own explanatory introduction (via this PDF) also appears to define hate speech and incitement to violence both as acts actually undertaken “that target a group of people sharing a common characteristic” but adds: “Acting in such a manner as to cause such types of speech to be engaged in or disseminated is also prohibited.” So not in fact inciting violence, but saying or doing something that prompts someone else to incite violence is inciting violence? It appears to be exactly the sort of mistake that, on the other side of the Atlantic, the European Guidelines on Freedom of Religion or Belief (2013) managed to avoid making, by remarking (see the Guidelines (PDF), section II. B. 2.) that unless an expression itself constitutes incitement to hatred or violence, then the fact that it may prompt others to engage in other expressions which do incite hatred or even acts violence is no reason to criminalise the first, non-hateful expression. 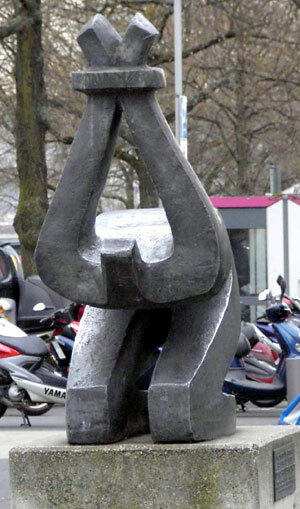 The Guidelines explain instead that highlighting the right of reply and discouraging the actual violence are much better options, and stress that “the right to freedom of religion or belief, as enshrined in relevant international standards, does not include the right to have a religion or a belief that is free from criticism or ridicule”. demonstrates the failure by Saudi Arabia to respect its national and international obligations in three specific areas in this case: the right to a fair trial, the right to freedom of expression and opinion, and finally, the absolute prohibition of torture and cruel, inhuman or degrading treatment. It requests the Supreme Court to draw the appropriate conclusions in the light of these shortcomings and revoke the verdict against Mr. Badawi.